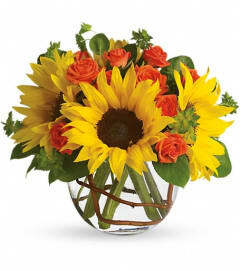 This arrangement is quite the show-stopper! 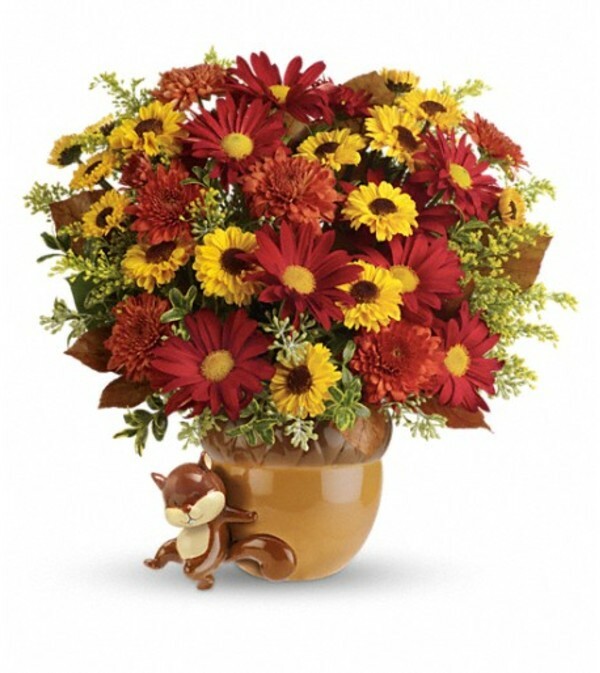 Red and yellow daisy chrysanthemums are arranged with bronze cushion chrysanthemums, solidago, oregonia, seeded eucalyptus and brown copper beech to capture the Thanksgiving holiday perfectly. It comes inside the adorable Squirrel Away Vase which is accented by a sweet little squirrel, everyone will be in love with it! 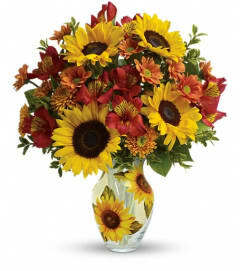 Red daisy spray chrysanthemums, bright yellow daisy spray chrysanthemums, bronze cushion spray chrysanthemums, solidago, oregonia, seeded eucalyptus and brown copper beech make this arrangement as memorable as itsvase! Delivered in a hand-painted ceramic acorn adorned by a charming squirrel motif.